Well, not exactly Moscow. Aeroflot was the cheapest way of reaching South East Asia and consequently we had to change planes at Moscow, spending six very, very dull hours in transit. The day got off to a bad start at Heathrow when the computer erased several of the passengers, including us. It was sorted out eventually, but Andy was very unimpressed and continuously compared the (quote) "shocking state of affairs" to the "high levels of professionalism and efficiency at Gatwick" where he had worked. Mind you, when the bus took us to the wrong plane, on top of all the computer problems, I had to agree with him. My cousin, who works for customs, came by to say hello while we were waiting for the computer to be sorted out. I tried to get her to arrange for some of her colleagues to give the other lads a hard time, but she couldn’t be persuaded. 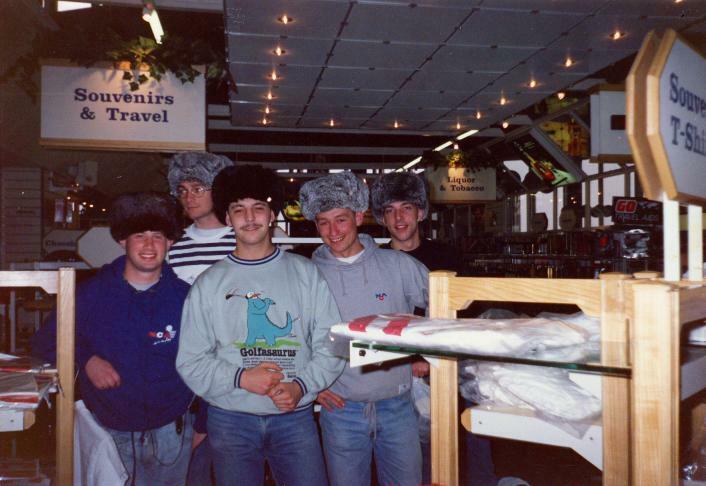 The check-in was full of expensively dressed Russians with trolleys loaded with boxes containing hi-fi's, video recorders, televisions and all manners of consumer goods. The classless society, I don't think! There was no sign of poor old of Jeremy from the Airport programme, but it was probably before his time. Moscow airport was spacious and modern, but looking out of the windows revealed a scene from the 1940's. There was a closer resemblance to a World War II airfield than to a modern international airport. At the duty-free shop, we pooled our vast capitalist reserves of hard currency and were just able to afford a pack of cards to pass the time with. We had also been pleased to discover that we were entitled to two free meals at the airport. As us capitalist pigs are always looking for a free lunch, we took advantage of this offer, but soon discovered that the meals were worth about what we paid for them. It was hard to imagine that the Russians used to queue up for hours in the snow for this crap. The flight from Moscow to Bangkok (via some god-forsaken armpit called Tashkent and then New Delhi) was a total nightmare. We did not expect any luxuries on this flight, but we did not know that the Russians' definition of 'luxuries' extended to oxygen masks, seat belts and life jackets. There were however two meals on this flight, but it was the same unidentifiable swill that we had to get pumped out of our stomachs in Moscow. Our full trays where collected by female Russian shot-putters who work as air hostesses during the off-season and who mumbled some gibberish in Russian which probably meant, "Well starve to death then you stuck-up, capitalist scum, as if we'd give a toss!" There were also no seat allocations on this flight, so getting the best seats was a question of being sad enough to get in a queue at the terminal gate and then run down the boarding platform as fast as you can, much to the disgust of the shot-putters.